Award-winning solutions for VDOT, government and municipal projects. Basic Construction Company is well known for reliability and excellence when it comes to road construction projects in Virginia’s Tidewater region. We’re proud to have earned multiple Virginia Department of Transportation (VDOT) and municipality road contracts throughout Eastern Virginia over the years, and we’re looking forward to helping you successfully complete your next road construction project. When it comes to your road construction RFP, you can rest assured that Basic Construction Company has been there, done that, and we know that proper paperwork is just as important to the process as finishing a road construction project on time and within budget constraints. Basic Construction Company has the experience, capability, equipment and personnel you require for any road construction project. We also own and operate a VDOT-approved asphalt plant in Newport News, so finding a steady supply of asphalt is never a problem for us. We take pride in planning and paving a road right the first time. Whether it’s 100 feet or 100 miles, with more than 100 years of road construction history under our belt, we know that a great road project starts well before our asphalt trucks arrive on the project site. So, if you are preparing for new road construction, repaving an existing road, or anything else that involves asphalt know-how, we can provide a professional solution for any of your road project needs. Need a Full-Scale Road Construction Contractor? Call Basic Construction Company! Basic Construction Company uses eVerify to ensure all employees are legal. Call (757) 249-3789 or contact us to discuss RFPs for your next road construction project today. 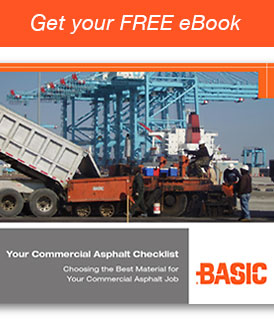 Our free eBook will help you choose the best material for your next commercial asphalt job. Request your copy now. Notable Road Construction Projects in Virginia by Basic Construction Co. This road construction project included surveying, land clearing, erosion control, grading, asphalt paving, concrete curb and gutter construction, pavement markings and signage.